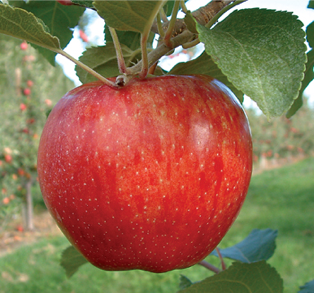 There is a characteristic of the apple tree which has led to a wide diversity of farming methods. This is the trees ability to be "grafted", which revolutionized the different strains and varieties of fruit available. Grafting is the ability of a host tree to accept a cutting of another tree. Meaning that you can take the branch from one tree and by making small clean cuts join it to a parent tree. The parent tree will then heal the wound and accept the new branch as its own. The newly joined branch will grow the same variety of fruit even if the parent tree is of a different strain. A practical example of this; I worked for some years tending the trees on a friends apple farm. One of the trees there had 5 separate varieties of apple growing on the same tree! 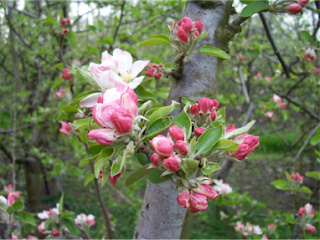 Interestingly, all modern apple trees have to be grafted on a crab apple tree stock at a young age to then grow the variety of apple needed. If you plant an apple seed you will not necessarily grow the same variety of apple as you have planted. All varieties of apple are grown by grafting only, it is the only way to conserve and continue a particular variety of fruit. On a more personal and symbolic level, who is the apple tree? The apple tree is a tree of giving, sharing, and perseverance. This tree is a symbol of love and the human condition played out around the mythic world tree. The apple tree gives its fruit endlessly year after year. The flowers have a heady aroma which is a favorite of bees and many types of butterflies. The perfume becomes stronger during the warm summer nights. In the Autumn months, one can see many wasps joining in the insect throng, gorging themselves on the bountiful harvest of apples. The Orchard buzzes all year round with a sleepy drone of insect humming accompanied by doves cooing. In many ways, it is symbolic of our preoccupation with sour day to day wants and desires. The apple is the material world, Maya's seductive fruit, with which we are tempted. 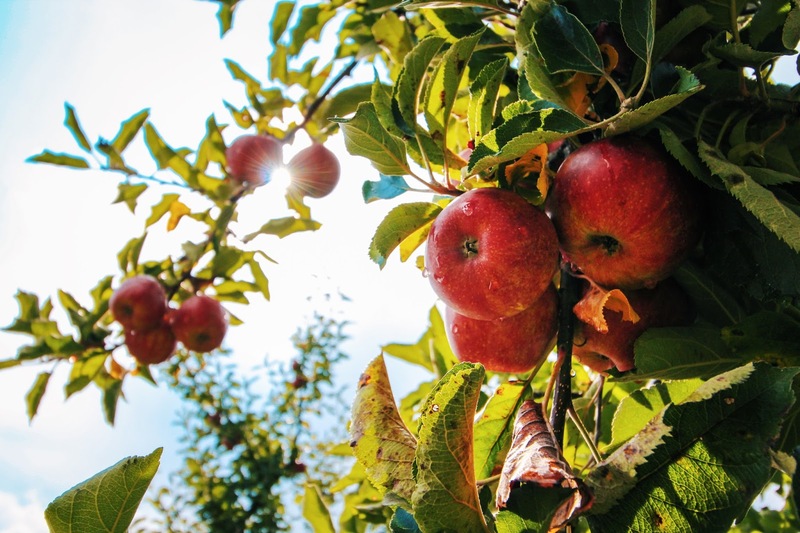 It is often told in the biblical story of Adam and Eve that the forbidden fruit of the tree of knowledge was an apple, and the eating of it cast us out of the original garden... out from the spiritual platform. The image of the apple has been woven throughout story and mythology and spiritual topics where ever she shows up. Just think of the European fairytale traditions where you will find stories of enchanted apples putting some intrepid hero or lovelorn damsel to sleep, or silver apple laden branches entitling one entry to some underworld or elfland. The comparison to the souls conditioning in illusion is obvious, eating the forbidden fruit causes forgetfulness and sleep. A wild apple tree has a different energy compared to a domesticated apple tree. The crab apple feels darker and more archaic. The limbs and branches of the tree grow more erect, the fruit is tart and small, the leaves are small and dark. The crab apple retains a feeling of wild nature, free and untrained. A domesticated apple tree is more welcoming and friendly than its wild cousin. The limbs of a domesticated tree are more open and inviting, the fruit is sweeter and larger, the leaves are bigger and lighter green in color. Sadly, when modern farming methods are used for high-intensity fruit production the trees often look stunted and tortured. Aside from the tree's association with illusion, it also speaks of love, life, and the human condition. To give someone an apple is an act of love and appreciation, it is the stereotypical bringing an apple to a favorite teacher. It is said that an apple shared between two people will cause friendship or love. An apple is packed full of nutrients, minerals and trace elements. So goes the old adage, "An apple a day keeps the doctor away". The pre-Christian festival of Samhain, which was celebrated in Celtic countries, coincided with the end of the apple harvest and featured apples in the celebration. It was an ancestor festival and the start of the pagan new year and so apples became associated with the dead. 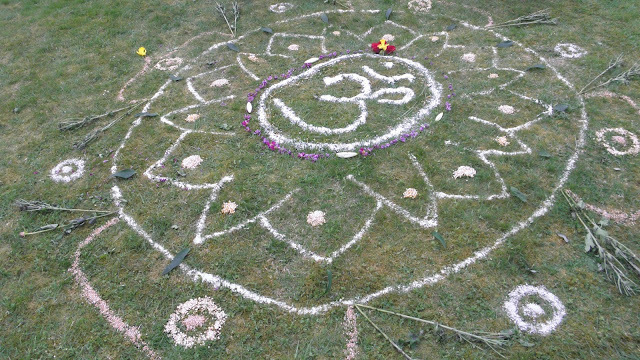 They were often piled up on altars as offerings to the ancestors. The modern survival of this tradition is children playing the game of "bobbing for apples" at Halloween. Old folk magic tells of making wishes by carving your intention into an apple and returning it to nature, as it is eaten or rots away so your intention comes to be. My favorite stories concerning the apple tree come from the folktales of America concerning Johnny Appleseed. Johnny Appleseed walked across frontier America in the late 18th and early 19th centuries starting apple nurseries wherever he went. Johnny Appleseed planted apple trees to show people a peaceable, vegetarian way to eat. He was a strict vegetarian himself, traveled bare-foot, and wore his cooking pot as a hat. He was a preacher and taught people the Word of God. He became a legend even within his own lifetime. He was loved and respected by Natives and settlers alike. "He preached the gospel as he traveled, and during his travels, he converted many Native Americans, whom he admired. The Native Americans regarded him as someone who had been touched by the Great Spirit, and even hostile tribes left him strictly alone". I'll end this blog post with one further story about Johnny Appleseed, hope you like it and see you in the next blog post! "One cool autumnal night, while lying by his camp-fire in the woods, he observed that the mosquitoes flew in the blaze and were burned. Johnny, who wore on his head a tin utensil which answered both as a cap and a mush pot, filled it with water and quenched the fire, and afterward remarked, "God forbid that I should build a fire for my comfort, that should be the means of destroying any of His creatures." Another time, he allegedly made a camp-fire in a snowstorm at the end of a hollow log in which he intended to pass the night but found it occupied by a bear and cubs, so he removed his fire to the other end and slept on the snow in the open air, rather than disturb the bear." Thanks for reading, please comment and share! Howe, Henry (1903). Richland County. Howe's Historical Collections of Ohio (485), New York:Dover. 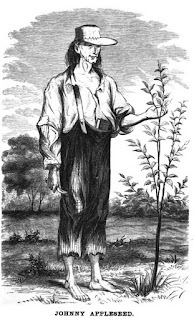 “Johnny Appleseed.” Wikipedia, Wikimedia Foundation, 5 Apr. 2018, en.wikipedia.org/wiki/Johnny_Appleseed. Kacirk, Jeffrey (1997). Forgotten English. New York: William Morrow & Co. ISBN 0-688-15018-7.